Ahh the classy characters of The Shire. Making the news for all the expected reasons. First up, two of the Shire Girls, Sophie and Vernesa, get into a fight with some old friends at a shopping centre. Charming. The old shopping centre fight, the height of class. No word yet whether it was because their old friends snatched the last cherry red lipstick out of the $5 bargain bin before the shire girls could get to it. This was of course jumped on for the exclusive scoop by A Current Affair, who took a rare break from the slander fest with Channel 7 to take a shot at channel 10's finest. Evidently, like the rest of the world, the police didn’t know who he was, and more importantly, didn’t care, and so arrested him anyway. As it turns out, this guy is not even a credited character on The Shire, he is the mate of a peripheral character on the show. Everyone’s a reality star these days. Another tragic example of the “Do you know who I am?” plight of a deluded reality celeb. So many forgotten reality stars who’s brains have been fried by too many $20 drink cards at suburban nightclubs into actually thinking that their brush with the biz should afford them the status of Prince Harry or Lady Gaga. But whereas other reality ‘stars’ are mostly harmless vain dimwits, The Shire has lived up to its predictions for being full of violent bullies, racists, homophobes, and just basically nasty conceited people. And Channel 10 is surely uncomfortable promoting these types. 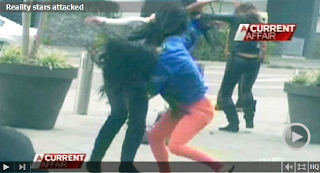 Its one thing to poke fun at two girls who’ve botoxed their brains into slush, but how do you promote some violent thug who’s likely next move is to king hit some kid at Maccas at 4am? No doubt there are sighs of relief behind closed doors at Channel 10 when the ratings come in to show that no one watches The Shire, except maybe its ‘stars’ who are attempting to see if their Southern Cross tatts look as hectic as the street side tattooist in Bali assured them it did. As The Shire follows Everybody Dance Now and Bingle as overhyped failures, trying to catch a glimpse of the show on its way out is as elusive as finding someone who actually thought it would be a good show in the first place. Shunted from timeslot to timeslot on its way down, it resembles a used lunch wrapper bouncing around the rim of a rubbish bin, before finally and inevitably disappearing down onto Channel 10’s crowded trash pile of 2012 misses.